the power struggle between the English and the French, both nations seeking to gain control of the area and its highly profitable trade routes and cash crops. 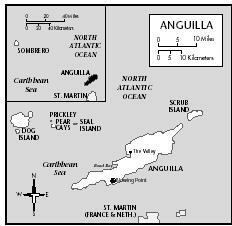 Anguilla was attacked by a group of Irish colonists in 1688, many of whom remained to live peacefully with the other islanders. Their surnames are still evident today. The French also attacked Anguilla, first in 1745 and again in 1796, but were unsuccessful both times. A traditional cottage in Lower Valley. 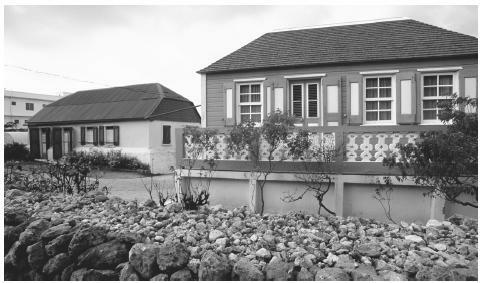 To take advantage of the island's temperate climate, Anguillan buildings often feature balconies or terraces. soil prevented the plantation system, which had long-lasting negative effects on many Caribbean societies, from developing. Most Anguillans are of mixed West African, Irish, English, or Welsh heritage. The small Caucasian minority is well integrated with the ethnic majority. 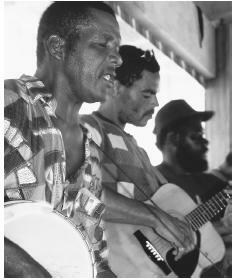 A string band plays on Scilly Cay. Tourism is now the most widespread commercial concern in Anguilla. must now contend with some of the negative effects of the tourism boom: dealing with large numbers of non-Anguillans who sometimes are insensitive to their customs; pollution; rising prices; a strain on the island's resources; and the influence of other cultures on their way of life. Other social concerns include maintaining their cultural traditions without giving up the benefits of increased trade and business with other countries, improving living standards, and keeping the illegal drug trade out of Anguilla. 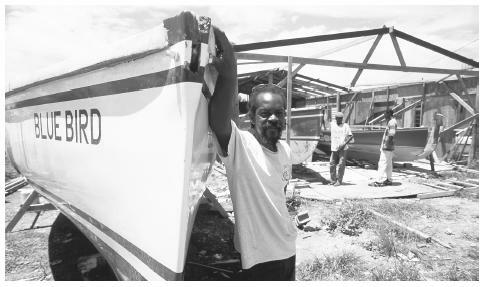 Shipwright David Hodge, known for building some of the fastest boats in Anguilla, stands by one of the boats he has built by hand. view than in some other Caribbean islands, where extremely poor economic and social conditions frequently contributed to the breakdown of the domestic unit. The domestic unit is generally stable until children reach adulthood and leave to start their own families. Daughters generally live at home with their parents until they are married. "Calabash Skyviews." Anguilla history homepage. www.skyviews.com . I'm an Indian and I live in Chennai,in South India. I teach spoken English to students. Right now I'm preparing twenty one youngsters from Angola for their IELTS exams. I truly admire their dtermination to learn English, a totally alien language. They are such a jolly lot and their cheerfulness is so infectious! With their help, I've learnt so much about this beautiful nation, its culture, its history and its people. I'm a surrogate father to all of them! And I feel so honoured to have such lovable and decent sons! I'll be a sad man indeed when they finish their exams and leave my country for good! Who is the person in charge of Anguilla.And how big is it. Does it ever rain.Does it ever snow?What do the people look like. What kind of sports do they do? Very comprehensive article with insights into the tactical, historical and cultural Anguilla. It is a first world island with the grace and charm of a nation rich in history and pride. Anguilla is indeed one of the jewels of the Caribbean, I pray that it remains unspoiled by the encroachment of negative influences that often accompany advancement and success. I was wondering about Anguilla's traditional dances and what they wear for their dances and what music is played for certain dances.Do you know where I could find that? Who is the govenor and what types of landforms are there and what types of econmics are there. What types of clothing do they were. Anguilla is a small islanda located north of St Maarten with roughly 15,000 inhabitants. The main language is English and we are a friendly people. Music played in Anguilla includes Jazz, Calypso, Soca, Reggae, Dancehall, Steel Pan, String Band Music and many other types of music. The Calypso, String Band and Soca as well as Reggae is local to us. There are of course combinations of culture and heritage in Anguilla. There are many folk songs and dances as well. Anguilla is a beautiful island, free from many of the outside influences. Please Note that Anguilla is a Caribbean Island. I am a born Anguillian and I still live there. This article facts are ok except the Obeah part. Nobody pratices that in our island. Just a note. Is there a official National dress of Anguilla? I have never seen the National dress of Anguilla. What I have seen is the national colors which is white, orange and blue made in all kind of different styles and designed been represented. I am there for queen shows, Anguilla day, Ronald's Websters birthday and for Summer fest in August and have never seen it on display! My roots is from Anguilla and I am also a Anguilian! Thats my home away from home! Im 11 and I was born in Anguilla and I still live here in Anguilla.Right now is really hot in the day and cold in the night .I was just getting some information for my lil sis . Anguilla is quiet rigt now and we the children are getting ready for school on monday . Anguilla is a little paradise .We have beaches and hotels ,one of our most famous hotel is vieceroy . Celebreties come here in Anguilla for christmas,newyears ect. I was just on the website and just wnted to say hello and just one thing if you come to Anguilla you will not wnat to leave. Very informative,I have always read about other Caribbean Country but never knew these interesting facts about Anguilla. Hi, I from Canada and my desire would be to move to Anguilla BWI and make it my home with my familly. I read all I can find about Anguilla and find it to my liking. Great small country and even greater people. Bless all of you. God willing. We will be seeing you soon enough.